The breeder was right. Babies (he is still not a juvenile) need access to food all day long. The trick is to offer foods that are nutritious and filling but not fattening -and that's another problem with pellets, they are so dry that the bird, which is 'programmed' to fill up his crop completely, will end up eating too many of them -think of compressed saw dust, when it's dry and compacted, it occupies a small space but, if you put it in water, it grows three or four times its original size, right?, well, it's the same thing with pellets. And that's another reason why we feed gloop! Because as the grains are cooked (and thus, infused with water and enlarged by it), they can eat as much as they can and will not gain weight. So, by all means, fill up his bowl with it and offer large pieces of raw produce so he has plenty to eat all day long - he won't become overweight, I promise you. I've been feeding gloop for the last 20 years and don't have a single overweight bird. Now, you mention 'papaya cubes', is this dry papaya? Because another thing you need to take into consideration is dry fruit that has been treated with sulfites. They use it to make the fruit retain its color and elasticity (naturally dry fruit looks terrible, all brown and yukky! ) but it's not good for parrots. Also, be careful with onions. 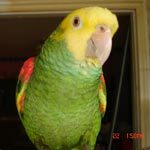 I have never been able to find anything about how they affect parrots but they are not good for dogs or cats (kidney failure) so I choose to play it safe and never give my parrots any. Just one more comment. Please allow him to make his morning bomb (the big poop they do first thing in the morning) before you bring him to your bed. It's not good for parrots (or any other animal, humans included) to hold their poop (there have been cases of cloacal prolapse from it). As for training him to go onto his/hers back for you(I am trying to get this with my bird and we are beggining to make progress.) is dont push him/her to much.. first of get him used to you putting your hand over his/her wings (just rest them there for a secon) make sure you reward her for allowing you to touch her like that. Also you can have him standing on your finger and say 'spin' (or whatever you want the cue to be.) and then turn your hand so as she is hanging up side down. do this till she understands what you are doing and dont forget to give BIG rewards and show her how pleased you are with the behaviour. This could take a long time (anytime between a week and a month or so) for her to be comfortable with so dont rush it or get frustrated at her, it can ruin everything. training should only be 10minutes a day for now max and then alot of time holding her to strengthen the bond and trust. Now conbine the two. have on her back and say 'spin' now spin your hand (she is on you finger btw) and she will be cupped in your hand. only have her there for a few seconds and flip her back up. Reward her and give it another go, very slowly holding her on her back for longer periong of time. This is where I am currently at but as you can see you can continue to hold him/her for longer and eventually hold her up like a phone. Oh also you can eventually increase training time to 15 minutes and eventually probably to twice a day. Hope this helps, and I will try to get a few pics of the steps. Kookooloo, CAG, started, about a month ago, to tuck her head down between her feet, so I put my other hand on her back and flipped her over on her back in my hand. She grabbed my finger with her beak while still holding onto my other hand and finger with her feet. As soon as she starts pulling either finger, I learned that she wants to go upright. She is now doing this about twice a week and seems to think it is great fun, I give her lots of praise for doing this, but I only do it when she starts tucking her head to request that I flip her over. I don't ever give her treats for this, just praise, this is because she will not do things like this for treats, she gets mad if I offer her treats for doing something. She does like treats, mostly almonds but only as a freely given thing, never for tricks. I would not recommend doing 15 minutes training sessions. I think it's better not to 'burn' them out and to end the sessions while they are still not bored at all by the whole thing. You don't want things to backfire and end up in square one because you overdid it. Actually, I never spend more than 2 or three minutes with any one " trick " in any session. That amount of time can seem like a very long when you don't understand what someone wants of you or if you don't like it. Wolf wrote: Actually, I never spend more than 2 or three minutes with any one " trick " in any session. That amount of time can seem like a very long when you don't understand what someone wants of you or if you don't like it. Same, but Tilly will be happy to go over things shes learnt when I get her up in the morning... Each bird is different/some love to be learning new things and find it very exciting. I think that most parrots enjoy learning new thing when the trust the human teaching them and as long as they feel secure. Most animals will be very happy to keep repeating all of the tricks that they have already learned, just don't forget to provide the expected treats when they do this. But it is very stressful to try to learn something when you don't understand what is said to instruct you, try it sometime for yourself. It is difficult enough when we try to show them as they don't always understand that the hand that we are flipping over is supposed to be them flipping over. In most cases if you can get even the slightest attempt to do what you are trying to teach them, you should reward that attempt right at first and build on that one little step at a time. For example if you are trying to get them to tuck their head for you to help them to flip and right at first you may need to reward them for even a quick bob of their head and then an actual nod and so on. Ha Ha. You mean no one told you it is their job to fling food around? Cleaning it up gives you something to do so you won't get bored.